More people want to write than to read – why? First of all, I must confess I can’t remember where I read that there are more would-be writers than readers, so it’s more of an eye-catching title than a statistical fact. But having said that, it doesn’t sound too preposterous to me. You would think the main reason why so many people are interested in writing is because they’d like to be published, perhaps with a view to changing career, or to making a fortune out of a single best-selling book and going to live in the Seychelles. This is certainly true for some. But I think for a lot of people who want to write, being published is not the main driver. It’s something more primitive and profound. People come to writing because they want to discover and tell their stories, not necessarily to the world, but to each other, like tribal elders gathered under a tree, or children making up games in the playground. I think there’s a yearning also, in such a material world, to connect with deeper layers of the self, and explore the mysteries of the inner world. What creative activities of every kind offer is an experience of total absorption and flow, and an opportunity for spiritual experience and community in a very secular world. 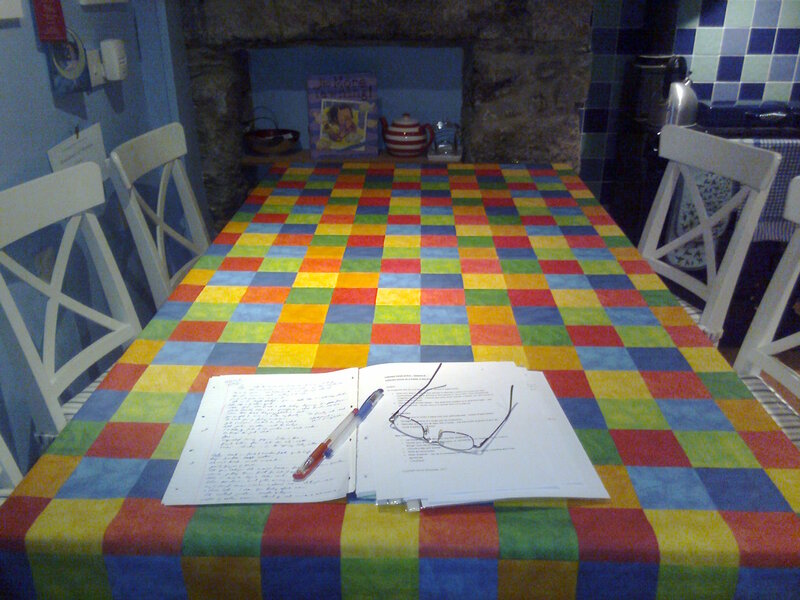 I’d love to hear your views, if you’re a teacher or participant in creative writing courses. Previous PostMy first blog award!Next Post5 blogging tips you might have missed – I did! Hi, as a writer and an author writing is now at the core of my life. When I participated in writing workshops I met a lot of people who wanted to write and their reasons were varied. I know writing controlled me. I didn’t decide to write. But for those reasons you mentioned a lot of people are trying it. However, writing is a vocation you can’t take lightly. If you are a serious writer there is a lot you need to learn. Hi Barbara, thank you for your comment. I’m really struck by what you say about feeling the writing controlled you, as if it was something you couldn’t not do. I think that’s what almost every professional writer has in common, as well as the willingness to put in the hard yards and learn. There’s so much raw talent in every writing group – I really feel it’s only drive and application that makes the difference between someone who writes for pleasure and an a professional author. I find the stats hard to work with – who worked this out? And what do they count as ‘reading’ – surely if you add up all the students pouring over their books, businessmen with their newspapers etc. it’s hard to credit. I have fiddled with writing for years before embarking on it seriously. But I’ve read – forever. And if I had to choose one or the other (heaven forbid – it would cost me much angst) I’d have to choose reading. I can still make up my own stories in my head, but can’t imagine not feasting on the stories of others. Thanks for your comment, Jo. I guess they mean writing and reading for pure pleasure. What makes you want to write? What makes it so enjoyable? That’s the fascinating thing, for me. Jenny – such a thought-provoking post. As a teacher, teaching English to adults, a lot of my students read but are frightened by the writing side, and I find, generally, I meet a lot more readers than writers. I read something today from John Braine, which really struck a chord with me: ‘A writer is a person who writes… You don’t think before you write. Writing is thinking.’ To me, this is the difference between a true writer, someone who has always written and feels compelled to write, and someone who aspires to write, possibly with views to fame and fortune. I write because I have to write, because my life would feel empty if I didn’t. I’ve taught reading and writing to elementary, middle, and high schoolers (mostly ESOL), and am amazed at how reluctant they are just to get their ideas on paper. We teach them to use pen, so they can never erase an idea! ‘Writing is thinking’ – I totally get that. It’s a way of engaging with the world that’s with some people from childhood. Whenever anything happened to me as a child, I always wrote about it – it was how I processed experience. I had forgotten that, Abi, so thank you for your comment. Natural talent, plus drive, plus application – and plus that kind of writing instinct – it’s probably all got to be there to drive a writing career. People who aspire to write for fame and fortune, as you say, won’t get there without it. But a lot of people who come to my workshops aren’t looking for a writing career, and don’t really know why they’ve decided to come. That feels like a kind of instinct too, and it’s because it isn’t particularly career-focused, that I sometimes feel the writing is feeding a fundamental instinct present in everyone, to sit together and share stories that have personal resonance to us. That’s a really interesting point, Jenny. There are people who want to write just for pleasure aren’t there? I think you’re right about sharing stories, and communicating. You’ve reminded me that my writing in my teens allowed me to express myself and deal with emotions – I never for one minute thought I would write ‘for a living’. Perhaps it allows that ‘secret’ side of us all to come out – to say things to a peice of paper that we can’t articulate to anyone else? Fascinating topic, Jenny! re: your above quote. I find that the above is very true but I also find that once I have written and reflected on something that is nigggling or puzzling me, deal with any emotions that come up and work out if it is something that I need to pursue, that I can express myself to someone else in the best possible way. Yes! I think there are also people who come because they think they want to be published, because that’s the obvious reason in our culture, but then are surprised by the pleasure of intimate writing and sharing in a small group, and possibly also by the understanding of how much work and determination is involved in moving from pleasure to publication. Do you know about Lapidus, Abi? It’s the organisation for therapeutic writing – they’ve got a fb page. That’s a whole nother fascinating subject! I started writing as a child because I ran out of the kind of books I wanted to read… I can clearly remember the day I’d either read (or tried) every book on the children’s shelves of our local library and was desperate for more! Obviously there must have been new books in shops I hadn’t read, but my mum couldn’t afford to buy very many of those so I started writing my own instead… maybe an example of creative play? A brilliant example Kath! One of my fave quotes from Jung is, ‘The creation of something new is not achieved by the intellect but the play-instinct – the creative mind plays with the objects it loves.’ That’s definitely, come to think about it, another of the reasons people come to writing workshops. Several participants on mine have remarked upon that feeling of freedom to explore and experiment, and play imaginatively with stories and characters in a way that takes them back to playground games of pretend. This raises the question of who we’re writing for – ourselves or other people, I guess. I do a lot of personal writing which I work and re-work and try to get as good as I can, in the same way as my published work, for the experience and adventure of it, as you say – but I don’t think you can become a successful author unless your writing really speaks to other people. That’s how you get a following, and I think you need to have your readers firmly in your mind when you write for others if you want to make a career of it. Thank you. I appreciate your insight. I used to enjoy keeping journals as an outlet. Now I have my blog. By followers, I meant via Twitter and blog subscribers. I feel like a lot of folks have an on-line following, then write a book for their captive audience. I would like to do it the other way around, because yes, I feel like I do have something to tell. The balance of writing as an outlet, and writing as a career is certainly tricky. There may be more writers than readers out there but if you think about it, each reader reads more than one book/article/anthology a year, or even in a week so there is a whole lot of reading going on. This year I have read widely, novels, autobiography, books on writing, on writing in health, emotional health, how to books, many poetry anthologies, many, many poetry collections by individual authors, I also regularly study my bible and many of my how to books are underlined in multicolour pens and annotated. Then there are newspapers and magazines. I don’t regularly purchase a newspaper though I subscribe to the news highlights by email but I subscribe to 3 writing magazines and usually buy Psychologies and some art magazines over the counter. I follow several blogs, i.e. this one and I am involved with several online and Facebook writers and writing in health sites including Lapidus and Poetry Space, though I am trying to limit my online time because I am spending too much time communicating with other people rather than concentrating on my own writing. I also write my journal and lots of poetry. I have entered a few writing competitions this year and have succeeded in getting a ‘nanofiction’ story published in Leaf Press’ ‘Pod,’ and a poem in Sue’s ‘Green Space’ anthology. All this being said, I should be spending more time writing, editing and plucking up the courage to submit to more competitions so it’s TTFN. Hi Karen – your taste in reading seems very similar to mine, and I do agree there’s soooo much reading going on. It can get in the way of your writing, when you start reading a lot online and interacting in these communities, but I think it also feeds the writing by sparking ideas and garnering recommendations. That’s what I tell myself anyway! Well I am not a solitary person so although I do read a lot I just love intereacting with others, especially creatives. It’s just a matter of balance.